There are times in everyone’s life when we cannot get to the end goal we desire despite how much effort, hope, or prayer we apply. One of the keys to a successful life, not only for you but for those underneath your influence or command, is to know when to step aside. This is a great reflection of true leadership but it is too often unrecognized. On the news, I recently heard someone in a position of great authority reply, in response to a question, “We are doing the best we can.” While we certainly encourage this type of language among children to encourage them to truly do their personal best and to develop self esteem, this verbiage has no place in a leader’s vocabulary. When I attended the Air Force Academy in the mid-80s, first-year cadets were allowed only five basic responses when asked a question by an upperclassman. They were “Yes, sir/ma’am”; “No, sir/ma’am”; “No excuse, sir/ma’am”; “Sir/Ma’am, I do not know”; “Sir, Ma’am, I will find out”. That’s it! No more, no less. This first year of only answering with these responses stick with me to this day. It’s probably why, when someone answers me with an excuse, I feel a tremendous urge to tell them to drop and give me twenty! The service academies are first and foremost leadership academies. After all, you cannot defend against all enemies, foreign and domestic, if you are not a leader. And that is the primary job of a leader, to take care of those under their care. Had I ever answered “I’m doing my best” as a cadet, I’m sure I would have been drummed out of the corps, and rightly so. Had I ever answered “I’m doing my best” to a Fortune 500 customer when they asked why their five-million-dollar piece of equipment wasn’t ready, I’m sure I would have been fired, and rightly so. If, when running a classified project, I replied “I’m doing my best” when asked why there were documented security violations, I’m sure I would have been escorted off base, and should have been. If you have truly done your best and still cannot get the job done, do not let your ego sink all the good things you’ve accomplished. 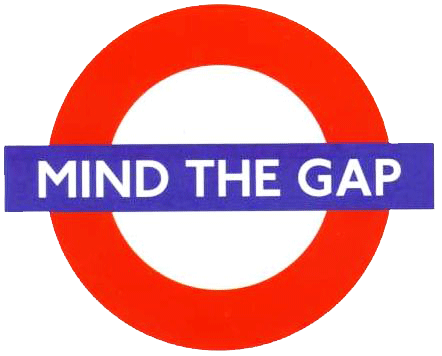 Realize it is time to move on to the next area requiring your particular set of talents and let the next team come in. That’s why we have succession plans and it’s why no one, no matter how smart or how powerful, is ever indispensible. Do not ever say, “I’m doing the best I can” because that is never an answer that serves any purpose other than making an excuse for yourself and alienating or infuriating the questioner. If no one is responsible for the consequences of their mistakes or can claim victory for their successes, what’s the point of living? We may as well be drones, our lives flown pilotless as we live off the labors of others. We no longer have high expectations. 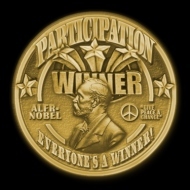 We give medals for participation. Eighty percent of the work is still done by twenty percent of the workforce. There are industries that penalize workers who complete tasks too efficiently. More people go on disability than payroll. We are told that debt will strangle us into servitude yet students are allowed to rack up hundreds of thousands of dollars of academic debt, and our country keeps printing money it can’t afford to spend. Whether you agree with it or not, the man who does what needs to be done without being told draws the most wages, unless he’s on the government dole where his pay is guaranteed. Now, however, we are having a national discussion about whether or not the man who draws the most wages needs to give those wages back to those who haven’t earned them. We are failing to continuously inspire the work ethic that instills greatness in others. Initiative has become a dirty word. Life should be lived tremendously as one triumphant pageant after another, not as a spectator sport. Yet everything now being taught seems to focus on patting oneself on the back for just existing while waiting for your next check to come. As the Good Book says, “Where there is no vision, the people perish.” You can’t be a leader if you don’t have vision. The very price of leadership is vision, which is simply seeing what needs to be done and doing it, without having to be told and without the expectation of reward or accolade. Just doing what needs to be done, period. 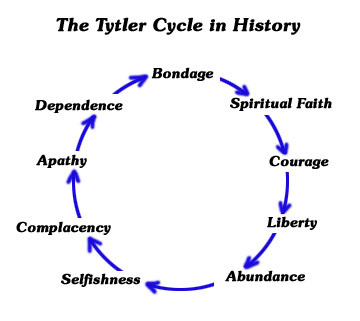 Over two hundred years ago, Alexander Fraser Tytler is said to have described the cycle of democracy which typically spanned 200 years: “A democracy cannot exist as a permanent form of government. It can only exist until the voters discover that they can vote themselves generous gifts from the public treasury. From that moment on, the majority always votes for the candidates promising the most benefits from the public treasury with the result that a democracy always collapses over loose fiscal policy, always followed by a dictatorship. The average age of the world’s greatest civilizations has been 200 years. So where are we? When the dependents outnumber the independents, dictatorship is not far behind. please stop praying for me, i need all the problems i can get! Many would consider me a very happy and successful person. Yet you won’t know the challenges and struggles that made me that way. You only see how I have chosen to deal with these situations. 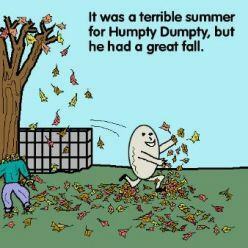 My father used to jokingly call this “happy miserable” but he was dead serious. If challenges are opportunities, if the path to success is through failure, then why do we wallow in self pity or run away? It takes maturity and accountability. There were times when I recounted my “poor me” situations for years to anyone who would listen. What a terrible waste of time and energy. At least half of the failures and heartaches I went through were due to my own lack of strength, discipline, or willingness to follow my conscience. The other half were situations meant to teach me some vital lessons about life here on earth. 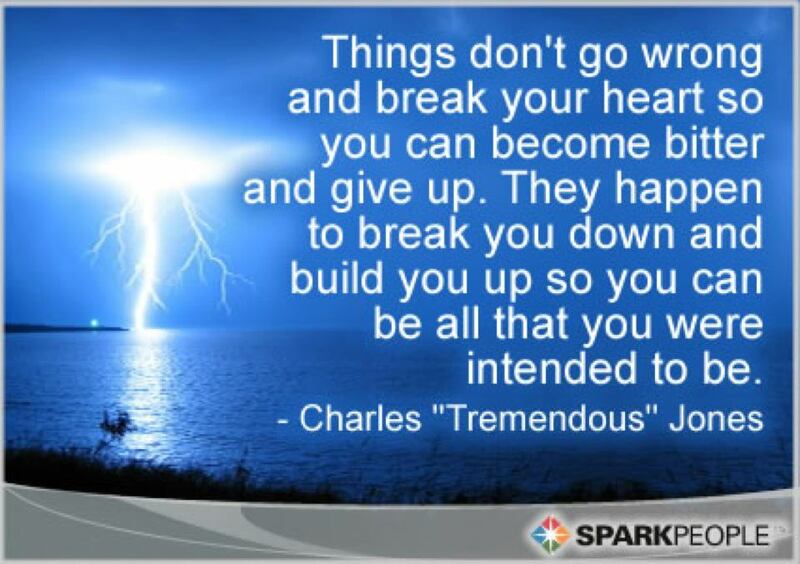 As Charlie “Tremendous” Jones used to say, “Things don’t go wrong and break your heart so you can become bitter and give up. They happen to break you down and build you up so that you can be all that you were intended to be.” And yes, even things that go wrong due to my own shortcomings can teach tremendous life lessons. Embrace your problems because sometime in the future, you’re going to cross paths with someone going through the exact same thing and you just might be able to impart some compassion or insights to them. It’s not about you; it’s about using what you’ve been through to help others and to grow as an individual. No one is ever successful being a victim. But if you look at your trials as a godsend, I guarantee you sometime in the future you’ll be a positive impact to someone who desperately needs it, including yourself. When a person begins to grow, the obstacles become bigger and better! And so do the failures. In his bestselling book, Life Is Tremendous, author Charlie “Tremendous” Jones states that we are all born with an empty psychological key ring by our side. Every experience we have in life gives us another key which we can use to move forward. Of note, failures give you double the amount of keys as successes do. Life is tough even for the wealthiest, healthiest and smartest of us. It just is. I love Sydney J. Harris’ quote, “When I hear somebody sigh that life is hard, I am always tempted to ask, “Compared to what?” Most people are miserable because they expect everything to go right. Plan on your plan going wrong and you’ll have a successful plan! God never breaks us down with problems except to build us up. Life isn’t to be happy—life is to be growing. And we all know there is no such thing as growth without pain. My father always said that a sure-fire growth formula was to cram fifty years of failure into fifteen. He was right; boy was he right. In the end, it’ll all be okay; if it’s not okay, it’s not the end. So next time you fail, remember: you are in the company of the greatest individuals who have ever lived because you have stepped outside your comfort zone and become more tremendous than you were before. If you’re going to be a success you’re going to have to learn how to embrace your failures so you can grow. I guarantee you that failures are going to happen no matter how many tremendous New Year resolutions you’ve made. Want to be the sharpest knife in the drawer? That’s means you’re going to have to take relentless pounding and unbelievable heat. Want to be the most precious gem in the box? You’re going to have to go through years of pressure and high temperatures. No one likes to fail but if you aren’t learning how to capitalize on your challenges, tribulations, and mistakes, you’ll never become all that you were meant to be. 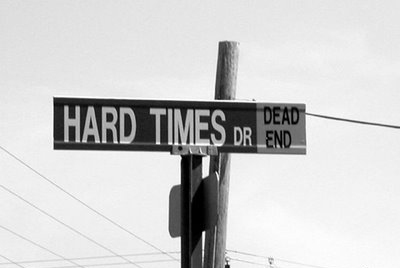 Life is tough and people hurt. No matter how rich, famous, or successful you become, there are certain painful inevitabilities in life that we all go through. That’s a fact. I’ve had some great things happen in my life, but what defines me is my scars. The real purpose of pain is to make us better, not bitter. My mistakes and heartbreaks make me stronger, wiser, and more empathetic. Everything in life that happens to us contributes to making us who we are, especially the bad things. Problems are invaluable because in working through them you become something greater and stronger. Whenever someone would call my father and tell him about a problem, he would exclaim “I’m going to pray your problem gets worse!” He joked that he was the only person in America people would call and say, “Mr. 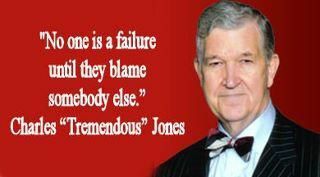 Jones, please stop praying for me!” But his point is clear. We are put through the fire so we can emerge sharper, stronger, more resilient and brilliant. So why would he deny anyone that opportunity? So instead of wishing everyone a Happy New Year, let’s start wishing them a Crappy New Year! After all, that’s really the only way we’ll finish 2013 more tremendous than when we started. The Key to Excellence, my favorite speech of my late father, Charlie “Tremendous” Jones, was recently transcribed into the latest volume of our Life-Changing Classics series. It was originally delivered back in the late ‘80s and is one of the funniest, yet most pragmatic, 42 minutes ever recorded on discovering that the key to excellence is all about thinking and realizing, not listening and memorizing. Get others to learn to laugh at their mistakes. One of the funniest moments is when Mr. Jones shares the result of his thirty-five years of experience distilled into two words. He claims this knowledge is experiential and not theoretical and then proclaims at the top of his lungs, “NOTHING WORKS!” much to the delight and roars of laughter from the audience. Learning to laugh when you hurt and things go wrong ensures you become better and not bitter. Be learning that communication is not from your mouth to another’s ears, but from your heart to your mouth. When you speak from your heart you begin to identify with the other person and the barriers begin to come down. Even in today’s virtual world, communicating with people is a necessity and a tremendous therapy and one of the greatest keys to our success. Being in the business of listening to, writing, publishing, and promoting personal-development material over the past three years has reinforced one critical lesson that I’ve been learning my entire life. Real help, real motivation, and real discipline are drawn out of only one source—you. You are the only architect of the greatest DIY project on planet earth: yourself. 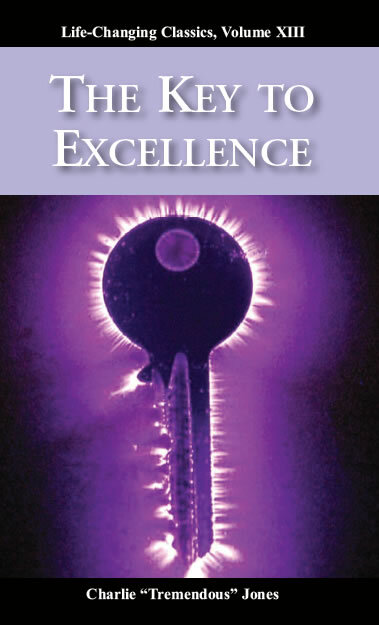 As Galileo Galilei said, “We cannot teach people anything; we can only help them discover it within themselves.” Reading great books and being around positive people to draw it out of you are proven keys, so start by getting your copy of The Key to Excellence and unlock a Tremendous 2012!